About BCMI – Texturewood® Floors by Birch Creek Millwork, Inc.
At Birch Creek Millwork, Inc., home of Texturewood® floors, we manufacture wood floors of premium quality and superb craftsmanship second to none. Our floors reflect home in any setting, from the work place to the presidential suite. Texturewood® is an exclusive product line of Birch Creek Millwork, Inc. Originally, Texturewood® was created in an effort to offer a new rustic floor, with all of the beauty and characteristics of an antique floor, at a substantial cost savings. Since that time, Texturewood® has become one of the industry's leaders in quality-crafted, machine-distressed, and hand-scraped solid wood flooring. Our machine-distressed floors offer a variety of surface textures including: 3D™, Band Sawn, Circle Sawn, Draw Knife Distressed, Hand Scraped, Hand Scraped Chalet, Hand Scraped Plus, Skip Planed, Skip Sawn, Smooth Planed, Smooth Chalet, and Wire Brushed. The Band Sawn and Skip Planed textures are our most recent additions to the Texturewood® line. All of our distressed floors make a powerful design statement while inviting a century-old feeling. They radiate strong character marks, exciting grain patterns, and dramatic knots, all of which are a vital part of Texturewood®. 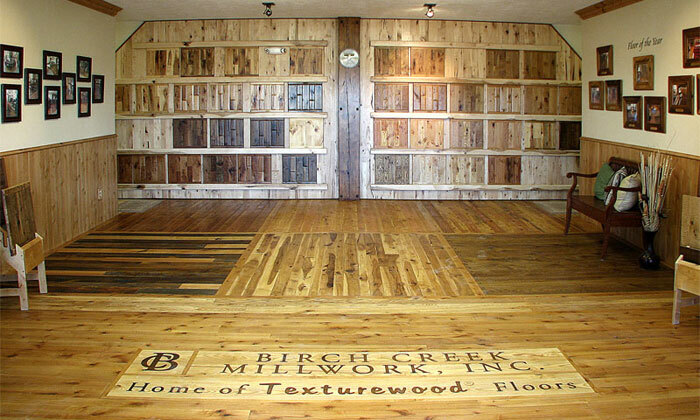 Rescued/Reclaimed floors are also part of our Texturewood® line and are available with textures on certain species. Our rescued/reclaimed floors also possess their own natural patinas, rustic characteristics, and age-old features. Most professionals who have installed Texturewood® floors realize the cost savings and prefer installing them over all other conventional strip and high-speed milled floors, because there is less installation and finishing labor required. Texturewood® floors are intentionally milled slower to ensure a higher level of quality assurance and precision, which equates to less time and effort in the installation. The texturing process itself, typically removes the necessity of sanding, so a screen and coating requirement is all that is left to the finishing procedure. The floors install quickly and easily! At Birch Creek Millwork, Inc., we have built a reputation for exceptional craftsmanship and outstanding quality and service. Our mission is to continue in this tradition help builders "Get it Right…The First Time!" We're "Big enough to accomplish any job, yet small enough to care." 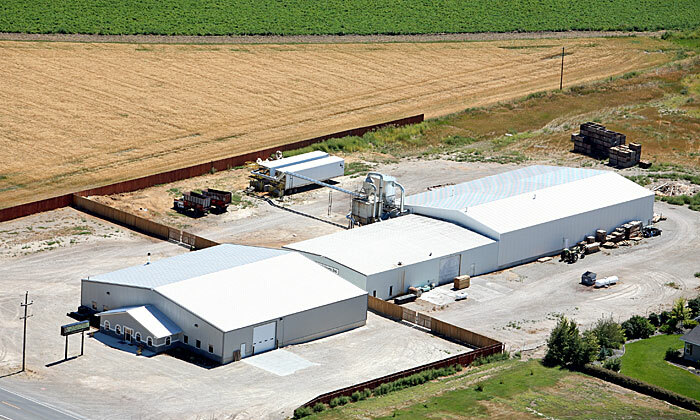 Here is an overhead picture of our facility. Often in the flooring industry, "rustic" or "character" grade floors are a result of floors containing lots of shorts, machine burns, and other manufacturing defects. You get what's LEFT OVER after the better grades have been sorted out. That's not the case with Texturewood® floors. We select lumber that allows character of grain patterns, knots, and natural imperfections. Each board is carefully hand selected in an effort to enhance it's rustic nature. We use a mill run process which allows for a high percentage of longer lengths and contrasting color. Nothing is sorted out for other grades or purposes. YOU GET IT ALL: greater color variations, longer lengths, a selection of several unique textures, and the highest quality milling and craftsmanship available.